Naming a star, a crater, or even a planet after a loved one seems pretty romantic. After all, what makes a better gift that a rocky barren ditch that might one day trip up a future Mars rover? Or a star that could one day be consumed by a hungry black hole? So fleeting. Yet so popular. So let’s take this idea of off-world gifts and really, really run with it. Why buy a chunk of a Moon rock when you could use that excessive expendable income to add to the extremely short list of human beings who have actually journeyed to the Moon? 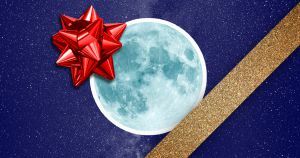 You’ve got a few options when it comes to gifting a ticket to the Moon. First, you could go with SpaceX. Last year, Elon Musk announced two private citizens will be flying around the Moon in a SpaceX rocket. More recently, he unveiled more details about one of the passengers: Yusaku Maezawa, a Japanese billionaire entrepreneur and art collector. While neither Musk nor Maezawa would reveal the actual cost of the trip, Maezawa reportedly already paid a “significant deposit.” In addition, Musk did hint that a roundtrip ticket would likely cost the same as a visit to the ISS. A 10-day trip will run you about $55 million, according to Axiom Space. However, by many accounts this number can vary. NASA pays Roscosmos just above $81 million for a round-trip to the Soyuz capsule, according to The Verge. Alternatively, there’s Space Adventures, a company that charges around $150 million per seat for a trip around the Moon. During the journey, customers will see the far side of the Moon lit up, and watch an Earth rise, all from the comfort of a Russia spacecraft. This price includes 10 days docked on the ISS, acclimating to the new environment. Other perks included in the cost are training, and a personal cosmonaut guide. While the cost might sound steep, think of the lunar tourism opportunities! You can take check out the site of the first human landing – AKA Tranquility Base, see Buzz Aldrin’s foot print, U.S. flags, or even the golf balls astronaut Alan Shepard hit during an Apollo 14 moonwalk. If only all gifts could be so out-of-this-world.